20 pp. Roman, 506 pp. Transitiveness in languages has always assumed the presence of a subject external argument and an object internal argument in predication-sentence structure. It also divides predicates into transitive and intransitive predicates. 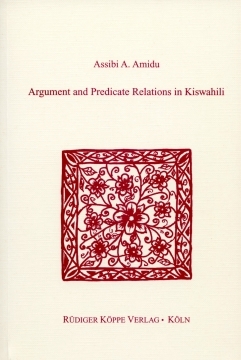 The book argues that in Kiswahili and Bantu, so-called intransitive predicates are transitive or can be transitivized by a principle called the principle of extended predication (PEP). The PEP reveals that passive, stative, reciprocal, and other traditional intransitives are transitives, and allow so-called agent or agent-like phrases as syntactic objects, and they undergo object relativization operations. Nominal predicates (prepositions) make this process possible. PPs are themselves arguments in Kiswahili and Bantu and they generate subject and object agreements and allow object relativizations. It is argued that only argument elements of transitive predicates can undergo object relativization in Kiswahili and Bantu. This is because the domain of relativization is always a predicate in Kiswahili. The work further shows that subject plus object can and do share a single subject agreement marker in Bantu while the object or object-like NP is in its base. It also draws attention to SOV and OSV structures in Kiswahili and shows them as confirming the transitiveness of predicates generally, including passives, statives, etc. in the language under description. The work concludes that we need to recognize a category called the Object Agent (OA) in linguistic descriptions and abandon the claim that agent theta in the world’s languages does not function as object due to structural and morphological constraints in predication-sentences.